Last year I bought a custom bike from Roberts Cycles. I went there in June to get measured up and choose the various components, then I collected it in August. I was a bit "nervous" about it at first, because it was quite different to my Brompton (or the SJA mountain bikes): I had to clip in to the pedals, it had dropped handlebars, and the gear controls were different. So, for a while I just stuck to the Brompton as my default choice, since it was familiar and comfortable. I brought the Roberts bike home on 7th August, then I did a short trip (2km) on 22nd August and another short trip (5km) on 19th September. I didn't start doing proper journeys until 23rd September, almost 7 weeks after I'd collected it. Once I made the effort to get used to the new bike, it served me well. I used it for my daily commute, and some longer journeys (e.g. going down to Brighton), then for my LEJOG attempt. Unfortunately, someone stole the bike in Manchester. I've been watching eBay listings, but after 5 months I've given up hope of spotting it there, so the only way I'll get it back is if the police happen across it (e.g. if they arrest the new owner for some unrelated crime). I hadn't insured the bike, but I've been saving up to buy a replacement; the money I got from doing a clinical drug trial has helped with that. So, I'll phone Roberts tomorrow to arrange another meeting. I'm basically going to ask for the same spec as before, but there are a few things I want to change. This is partly based on my experience with the bike, and partly based on what I've learnt elsewhere, particularly from Sheldon Brown's website and the book It's All About the Bike. Roberts normally sell Brooks leather saddles with their bikes, and those saddles have an excellent reputation. However, I try to be a good vegetarian so I had to go elsewhere for a synthetic version. In the end, I wound up buying one at Evans on my way to collect the bike, so it wasn't a carefully researched decision! The one I picked was from the Specialized Body Geometry range. There were various sizes hanging on the wall, and I felt that it was slightly unfair to implicitly ask "How big is your bum?" Mind you, the Specialized website implies that there's more to it than that, so next time I'll try to find somewhere that can do a proper sizing. I don't recall which size I bought, but it worked out ok. I always knew that I wanted a steel frame; when I turned up for the initial fitting, they acknowledged this as a good feature of my Brompton! It's not light, but it's strong. According to Breton Bikes, Reynolds 853 is "the strongest steel cycle tube in the world", which I find reassuring, especially since I tend towards heavy touring (I used 5 panniers on my LEJOG attempt). 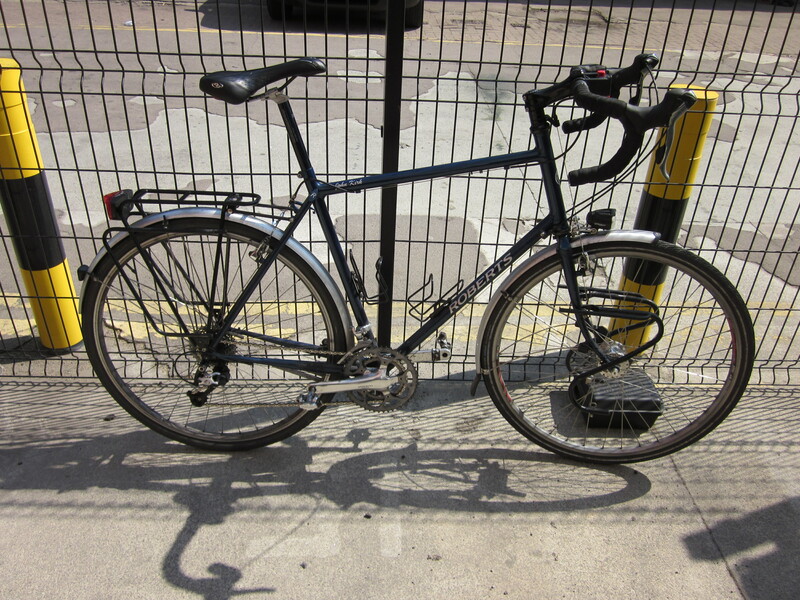 The "empty" bike (as above) weighed 15.3kg, so it was slightly heavier than my Brompton (13kg). It was also a bit more cumbersome to carry upstairs to my flat. With the Brompton, I could put the folded bike on the staircase along with the bags/trailer (as shown here), then lock the door behind me and go downstairs. With the Roberts bike, I had to make two trips: I'd carry the bike downstairs (unloaded), then come back for the panniers and to lock the door. Similarly I'd make two trips upstairs when I came home. However, I could carry the loaded bike up a flight of stairs if necessary, e.g. at a station where I had a big flat area to put it down at the top and there were no bends in the middle. If I lived somewhere with ground-floor storage (e.g. a garage) then this wouldn't be an issue at all. I went cycle touring in France last year, and I asked for a touring bike with dropped handlebars. However, when I tried it out I felt very uncomfortable, almost unbalanced, so I swapped that bike for one with flat handlebars. By contrast, I never really had any trouble with the dropped handlebars on the Roberts bike, once I'd overcome my initial hesitation. I think the key point here is positioning. I read a theory somewhere that lots of people think they don't like dropped handlebars when really they're just sitting in the wrong posture. (I think that was at Sheldon Brown's site, but I can't find it now.) When I picked up the Roberts bike and gave them the saddle, they consulted their notes for the correct height of the seat post, then pulled out a ruler to make sure that it was exactly right. I assume they did something similar with the handlebars before I arrived. There's a similar issue for the size of the frame. In CRU, one of our training exercises involves cycling in a circle inside a square of cones. However, I had some trouble with that because my feet would bump into the front wheel when I turned it. That was never a problem on the Roberts bike, because they built it specifically to fit me. Really, that's one of the frustrating things about the theft: unless the thief is exactly the same shape/size as me (which is unlikely), they won't get any benefit from the custom frame over an "off the shelf" bike. I also have to compliment the welding job: the joins were seamless, so if I didn't know better I'd think that it was all one continuous piece of metal rather than separate tubes. The only problem I had with the handlebars is that the tape started to come off during my LEJOG attempt. That wasn't disastrous, but I would have taken it back to the shop afterwards to have the tape replaced/reattached, and I'll ask whether there are alternatives. I insisted on Marathon Plus tyres, although Chas Roberts wasn't too enthusiastic. They had the desired effect: I didn't get a single puncture in 8 months. For my daily commute, I'm more concerned with reliability than speed. However, if I was doing another long tour then I might swap them for lighter tyres, since there's less broken glass on the roads outside cities. I specifically asked for a kickstand, but there was a slight mix-up and I got a central fork stand instead. This still worked, and I used it frequently to support the bike when I didn't have a convenient wall to lean it against. However, it meant that only one wheel could be on the ground at a time. This would usually be the rear wheel (particularly if I was using rear panniers), and the front wheel then swung around. Motorbikes often use a centre stand like this, but they have steering locks (making it harder for people to steal them) so the front wheel stays put when it's in the air. So, next time I definitely want to get a sidestand. We use them in CRU, and it's very convenient to just hop off the bike and kick it down. I'm happy with the colour of the bike, which matches my Brompton. I'll get my name put on the new one, but I'll probably get "John C. Kirk" (rather than "John Kirk") just to distinguish it from the previous bike. The SPD pedals worked out ok, partly thanks to totherme's advice: I practiced on my Brompton for a while in advance, i.e. I'd twist my foot each time I stopped as if I needed to detach it from the pedal, so that I formed the habit. However, I did have a couple of "clipless moments" when my foot got stuck. In one case there were a couple of women chatting as they stood next to a traffic light waiting to cross the road. I pulled up at the red light, then slowly toppled over to my left, much to their surprise! One (alleged) advantage of these pedals is that you can double your effort: as you push down with one leg, you pull up with the other leg. I felt a gentle tug against the rising leg as I cycled along, but this was barely significant compared to how hard I pushed down. However, I've had a few problems on other bikes where my foot has slipped forward off the pedal, then the pedal has whizzed all the way around and whacked me in the back of the leg. (If you know where to look for cuts/bruises then you can recognise cyclists that way!) The workaround is to push down harder so that you're "pinning" your shoe against the pedal, but that means that you're wasting effort. I think that's the real advantage of SPD pedals, since they hold your shoes in place and you can just focus on moving the bike. The seat post was out, because the lock was too long to fit there. The seat pillar was also out, because I had a bottle cage there. (Ditto for the down tube.) The top tube was possible, but awkward: on this bike, the brake cable ran underneath that tube (inside the core quadrilateral), and I didn't really want to pinch that cable. My solution was to put it in a pannier, but that was a bit awkward. If I was carrying lots of other stuff (e.g. from a supermarket trip) then the lock got in the way, or if I was travelling light (e.g. going to an SJA class night) then I might not need panniers at all if it wasn't for the lock. One solution would be to use a different bracket, e.g. The MegaBlock, where the lock would dangle from loops under the top tube instead of being braced against it. Another option would be to attach it to the rear pannier rack, e.g. the Tubus Locc. When I considered that before, I was reluctant to replace the existing rear rack, but now that I'm choosing a new rack anyway it may be a better option. I lost my old lock at the same time as the bike, and I've replaced it with a New York Fahgettaboudit (Kryptonite's maximum security model). This is shorter than my old one, and it will fit into my bar bag. However, it's relatively heavy (2kg), so that may not be the best place to carry it. Anyway, aside from the lock issue, the rear rack (Tubus Logo) did a good job of supporting my panniers. I bought Carradice Super C bags: I started out with a pair of universal/front panniers (on the rear rack), then later I bought a pair of rear panniers and a bar bag. I alternated between the front/rear panniers on the rear rack, and I didn't use them all at once (i.e. front panniers on front rack) until I set off on my LEJOG attempt. In fact, I had to borrow a hammer at Land's End to make some adjustments! This is because there's a bit of an issue at the front. The "universal" panniers can indeed be used on front or rear racks, but you have to adjust the position of the clips (where the pannier attaches to the rack), and this is a fairly time-consuming job, so you wouldn't want to move them back and forth on a daily basis. When the front panniers are in position on the front rack (Tubus Duo), it's a very snug fit, i.e. it's quite tricky to get them off because you have to squeeze your finger between the rack and the wheel. Again, if you keep your bike in a garage then that's not really a problem because you can just leave the bags on the bike and empty them out (e.g. using carrier bags inside the panniers). In my case, though, it was a nuisance. The bigger problem is that there's a horizontal hook on the back of these panniers. On the rear rack, this slides around one of the vertical poles, and keeps the pannier still. At the front, there isn't an equivalent vertical pole, just a diagonal, and I couldn't get these panniers to hook onto it. That meant that they could pivot around the horizontal poles. They were still clipped in place, so they wouldn't come off the bike, but if I went over a bump in the road then it looked a bit like a bird flapping its wings! Based on that, I'll try to find a different model of "low rider" front rack this time, possibly the Tubus Ergo. Finally, the gears. My Brompton has 3 gears, which they explain in their FAQ: "Over the last twenty years, there has been a trend towards putting ever more gears on bikes; in part this reflects the rising popularity of mountain-biking, but it's a movement that owes at least as much to marketing as to genuine functionality. After all, how many of those gears actually get used?" That sounds sensible to me. I've seen a similar logic applied to razor blades, to the extent that The Onion parodied the five blade model before it actually existed. When I specced out my Roberts bike last year, I had a choice between a double or triple chainset, i.e. whether I wanted to have two or three chainwheels (sprockets) next to the pedals. Three would give me a wider range of gears, but two would allow smoother gear changes, so I went for the "compact double": the big wheel had 50 teeth and the small one had 34 teeth. Meanwhile, the cassette at the back consisted of nine sprockets: the smallest had 11 teeth and the largest had 32 teeth. That was fine for my daily commute and for some of my longer trips. However, I really struggled with some of the hills in Cornwall and Devon, even in the lowest gear. I was determined to cycle up each hill (rather than getting off and walking), but in one case I wound up with "ratchet pedalling". In other words, I'd put my right foot on the pedal, push down, then try to get my left foot up onto the other pedal before the bike came to a halt. If I wasn't quick enough, I'd put my left foot back on the ground (to stop the bike falling over), then pull the right pedal back up to the top and try again. Each of these attempts would move me slightly further up the hill, but after a while my right knee started to hurt. I expect to feel tired after long distance cycling, but I didn't want to actually injure myself in the process. I know some people who've had knee replacement surgery and can't easily cycle afterwards, so I'd like to delay that as long as possible. There are some potential workarounds for this, e.g. carrying less weight (belly/bags) or doing more training so that my legs are stronger. However, if the lowest gear is too hard for me then the simplest solution is to get an easier gear fitted. That means that I either need a smaller chainwheel at the front or a larger sprocket at the back (or both). I think the simplest solution is to get a triple chainset this time: these typically have 50-39-30, i.e. the smallest wheel would have 30 teeth rather than 34. Josie Dew goes a step further: her bike has a triple chainset (20-34-40) at the front and an 11-34 cassette at the rear. That might be a bit too extreme for me, since I did occasionally use my highest gear (on downhill stretches). I'm not really bothered about the gaps between gears, so I'd be happy to stick with the same overall quantity, but if I need more gears to get the desired effect than that's ok too. Digressing a bit, I know that some people like single-speed/fixed-wheel bikes. In fairness, I've never ridden one, so I don't exactly have an informed opinion. However, events like this are why they baffle me. If I had a gear that was low enough to get me up a monster hill (e.g. a 20% gradient) then I wouldn't want to use that gear on the flat or downhill because it would take me all day to get anywhere. Also, I wouldn't want to give up the pleasure of coasting downhill after I've hauled myself to the top. Maybe those bikes are just suited to fairly flat areas. I don't have any strong feelings about rim vs disk brakes, so I'm happy to follow the shop's advice on that. Similarly, I'll follow their judgement on crank length (for pedals) although I'd be interested to know how long the cranks are so that I can use gear calculators. So, I think that covers everything. If anyone has any advice, I'd be happy to hear it, and I'll post an update when I've got the new bike. If I was you I'd look at a Van Nicolas - they have a website (and a clearance range with 20-30% off), or you can view an buy them in Bike Plus (who will give you 10% off Van Nicholas' list price) on Brighton Rd, just before the dump. They can be bespoke, or off the shelf. Reasonably tourers are from £1,500. Titanium frames are light and strong (maybe 10kg for the whole bike? ), as they re used as an alternative to carbon. This should make you hill climbing easier - you could also add a mountain bike style 'super low' sprocket onto the rear cassette. If you want to secure your bike /s in my garage you can do - it has an alarmed padlock, and we could put a wall anchor in. If you haven't already brought a lock Oxford used to insure bikes locked up by their locks (there was a £5 admin registration charge). Thanks Liam - I had a look at the Van Nicholas website. Any of their custom frames cost an extra €495 (approx £425) compared to a standard size, e.g. a custom Pioneer frame would cost €1994 (£1717). By contrast, a custom Clubman frame from Roberts costs £995. Custom frames presumably wouldn't be sold at clearance, unless someone else had ordered exactly the same thing and then cancelled their order. So, I think this would be a bit more expensive than Roberts. When I went to the Brompton World Championship, I borrowed a bike with a titanium frame (as described here). That bike definitely felt lighter than mine, but only 1/3 of that difference was due to the frame. So, I'm not sure how much difference it would make on a touring bike, particularly when I'm carrying a lot of luggage. With the Brompton, I decided that it wasn't worth paying the extra money for titanium rather than steel, but I don't think there's anything wrong with titanium. The other advantage of Roberts is that I can deal with them directly. They've given me good service in the past, so I'm happy to go to them again, particularly while I'm living so nearby. (That's partly why I chose them over a Dawes Galaxy bike last year.) So, I went back to them yesterday, as described in my follow-up post. That's not a criticism of Van Nicholas, and it looks like they make good bikes, but for now I'm happy with Roberts. a) Kryptonite will only insure one bike per lock, so if you use the same lock for multiple bikes then you just have to pick one, then post in a form to register it. b) There's a maximum bike value per lock. This was £1100 for my old Evolution lock, and £2500 for the new "Fahg" lock. c) It's only valid for a year after purchase. I'm not sure what the rules are for Oxford locks, but probably similar. I'm going to do another blog post about bike security in due course. Thanks for offering your garage - that's very generous, and I'll talk to you about it the next time I see you.